Nanotechnology has been extensively investigated in the application of different drug delivery systems for various routes of administration. Novel nanoparticles have been developed and utilized for the treatment of many diseases. Due to the advantages of their targeted drug delivery, reduced toxicity, long circulation, and enhanced half-life, nanoparticles are particularly useful for use in long-acting formulations. In this paper, we focus on the overview of nanoproducts in the market and the technologies to make long-acting injectable nanoformulations. Different types of injectable nanomedicines have been introduced to markets, including liposomes, polymeric nanoparticles, nanocrystals, and relatively new antibody drug conjugates. Their properties are illustrated and their applications, as well as commercial available products, are summarized. Nanomedicine is an emerging field that combines nanotechnology with pharmaceutical and biomedical sciences, with the goal of developing drugs and imaging agents with higher efficacy and improved safety and toxicological profiles. According to BCC Research (www.bccresearch.com), the global nanotechnology market should reach $90.5 billion by 2021, from $39.2 billion in 2016 at a compound annual growth rate (CAGR) of 18.2%. 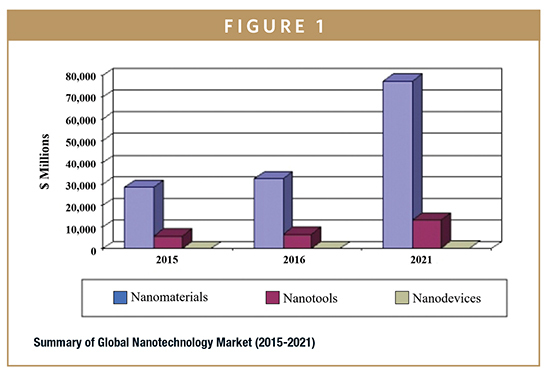 The nanomaterials market (which includes nanomedicines) should reach $77.3 billion by 2021 from $32.5 billion in 2016 at a CAGR of 18.9% (Figure 1). Nanomedicines include several distinct application areas, including drug delivery, drugs and therapies, in vivo imaging, in vitro diagnostics, biomaterials, and active implants. In these fields, nanomedicine has seen increased research activity throughout the past decade. Currently, nanomedicine accounts for about 5% of nanotechnology research publications worldwide. In this review, we focused on the progress of long-acting injectable nanoformulations. Nanomedicine products began appearing on the market more than a decade ago, and some have become best-sellers in their therapeutic categories. The principal areas in which nanomedical products have made an impact are cancer, CNS disease, cardiovascular disease, and infection control. 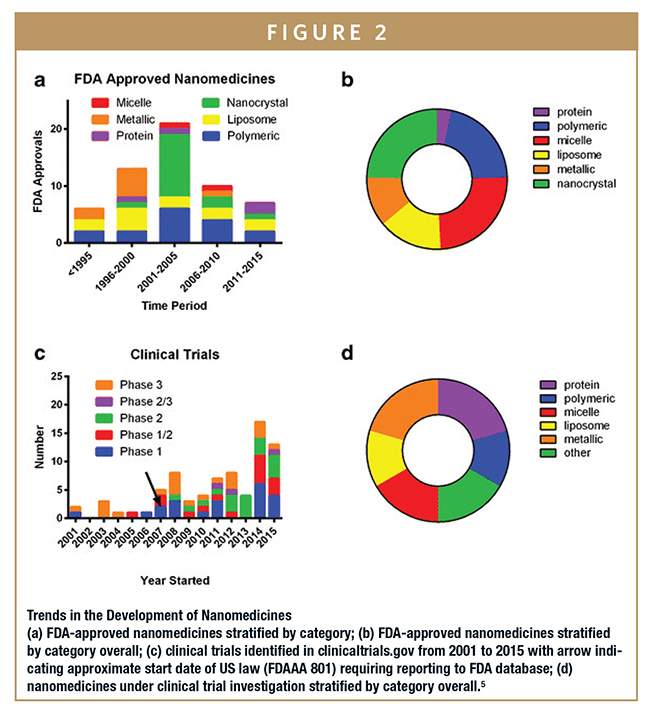 Figure 2 presents the trends in the development of nanomedicines in terms of drug products approved by FDA or currently under clinical investigation. Different types of long-acting injectable nanoparticles are included, although liposomal and polymeric nanoparticles are the most commonly used. Liposomes as nanopharmaceuticals are formed from phospholipids and cholesterol in aqueous medium. Liposomes have a spherical phospholipid liquid crystalline phase, and are simply produced by dispersion of phospholipid in water by shaking. This results in the formation of multilayer structures consisting of several bilayers of lipids. After sonication, these multilayer structures produce unilamellar structures that are referred to as vesicles. Liposomes can entrap both hydrophilic and hydrophobic drugs, and drug release can be targeted to specific sites. Biocompatibility, biodegradability, and low toxicity are the main advantages of liposomal delivery systems. Because injected liposomes can avoid uptake by the reticuloendothelial system (RES), the particles remain in circulation for a prolonged period of time. Typically, the particle sizes of liposomes range from 50 to 200 nm. To make liposomes suitable for therapeutic applications, their size distribution has to be controlled, which can be realized by passing them repeatedly, under elevated pressure, through membranes with defined pore size. In SLT, strands of the polymer(s) are attached to drug molecules, or to a system that can improve the safety and efficacy of the therapeutic agents. In general, PEGylation is attained by the incubation of a reactive derivative of PEG with the target moiety. Covalent linkage of the liposome to a PEG protects the active moiety from the recipient’s immune system, which results in reduced immunogenicity and antigenicity.2 It also produces alterations in the physiochemical properties of the active moiety, including changes in the hydrodynamic size, which further reduce its renal clearance and thereby prolongs its circulatory time. Also, it provides hydrophilicity to hydrophobic drugs and reduces dosage frequency. NPL is a unique drug delivery system that came as a breakthrough in cancer therapy by offering the benefits of a PEGylated-liposome while eliminating the side effects associated with PEG, such as hand-foot syndrome.3 NPL Doxorubicin (NPLD) injection provides a better safety profile over conventional DOX and Doxil®. NPLD not only reduces the cardiac toxicity associated with DOX, but also the dose-limiting toxicity linked with the use of Doxil. DepoFoam technology encapsulates drugs in its multivesicular liposomal platform without modification of their molecular structure. The multivesicular liposomes release drug(s) over a required period of time ranging from 1 to 30 days. Upon administration, DepoFoam particles release the drug over a period of hours to weeks following erosion and/or reorganization of the lipid membranes.3 DepoFoam technology improved the properties of both small and large molecules. This technology considerably improved patient care by providing a remarkable solution for medications that require frequent multiple injections and have a short period of action or side effects. Thermosensitive liposomes have been studied for drug release at sites of elevated temperature. These novel liposomes are being developed to exhibit temperature-dependent release of encapsulated drug(s). Local tissue temperature is generally elevated to 42°C by radiofrequency ablation, a technique based on the application of radiofrequency.3 Lipid components present in the liposome undergo a gel to liquid transition at elevated temperatures, making it more permeable, and thus releasing the drug. Polymeric nanoparticles possess the advantage of stability – both in storage and in vivo application. For polymeric particles, the drug is entrapped within the polymer matrix, usually a biodegradable polymeric matrix. Polymer nanomedines typically fall into one of two categories: (1) polymer-drug conjugates for increased drug half-life and bioavailability, and (2) degradable polymer architectures for controlled-release applications.4 However, it should be noted that aspects of polymer chemistry are emerging in nearly all of the categories because many of the components required (eg, amphiphilic block copolymers) can be designed and controlled through organic synthesis methods. The most basic class of polymeric nanomedicines utilizes single polymer chains, either directly as the therapeutic itself, or as a modifying agent for a drug or diagnostic agent. More frequently in terms of polymeric nanomedicines, drugs are attached to a hydrophilic polymer to increase circulation or to improve biocompatibility/solubility. The most well-established polymer is poly (ethylene glycol) (PEG), and PEGylation results in a significant increase in biological half-life in plasma. In addition to PEGylation, other hydrophiles can be utilized to increase circulation half-life. A polymer-drug conjugate of paclitaxel and polyglutamic acide (poliglumex/PPX) has entered Phase 3 trials and is showing significantly improved standard of living for patients who undergo paclitaxel therapy for non-small cell lung cancer. Beyond just extending the circulation time of established drugs, polymeric nanoparticles can be developed based on hydrophobic materials that facilitate controlled release of the therapeutic. This is achieved by using slowly degradable functionality that subsequently leads to kinetically driven release of the drug. A long-established polymer nanoparticle that has had significant success is based upon incorporation of leuprolide (a testosterone-inhibiting drug) into a polylactide-co-glycolic acid (PLGA) nanoparticle. Nanocrystals are composed of mainly hydrophobic drug with a small amount of excipient or surfactant, and different kinds of hydrophobic drugs can be nanoformulated into nanocrystals with high-loading and encapsulation efficacy. Micronization is widely used as a common formulationmethod for sparingly soluble compounds. The saturation solubility of the nanocrystals is highly related to the particle size, and solubility increases with particle size decrease due to the increased surface area, especially when the nanocrystals are below 300 nm. Consequently, the concentration gradient between gut lumen and blood is increased, which usually results inimproved absorption by passive diffusion. In these suspension formulations, the rate-limiting step for drug absorption is the speed for drug particle dissolution in the formulation or in the in vivo fluid surrounding the drug formulation. In many formulations, a fatty acid ester of a drug is used to prepare an oil-based parenteral solution, and the drug-release rate from the solution is determined by the drug partitioning between the oil vehicle and the tissue fluid; it can also be influenced by the drug bioconversion rate from the prodrugs to the parent drugs. To increase the circulation half-life, it is a widely accepted way in long-acting formulations for the parent drug to be synthesized into a prodrug through use of long-chain fatty acids (esterification). Due to their extremely low water solubility, the fatty acid ester of a drug dissolves slowly at the injection site after intramuscular (IM) injection. With the help of in vivo hydrolase, the prodrug is hydrolyzed into the parent drug and becomes available in the systemic circulation. Several other factors such as injection site, injection volume, the extent of spreading of the drug depot at the injection site, and the absorption and distribution of the oil vehicle can also affect the overall pharmacokinetic profile of the drug. Most of the nanocrystals approved by the FDA are used as oral formulations, and there are also some approved as a bone substitute. For long-acting injectables, the FDA has approved Invega®Sustenna® for schizophrenia and schizoaffective disorder treatment in 2009, and Ryanodex® for malignant hypothermia treatment in 2014. Invega Sustenna is a good example of long-acting injectable prodrug formulation (paliperidone palmitate is the prodrug of paliperidone palmitoyl ester). This long-acting injectable formulation is indicated as a once-every-28-days injection after an initial titration period. The production of nanocrystals has been applied to both organic drugs as well as inorganic materials. Synthesis methods include either “top-down” diminution approaches that are often employed for the organic compounds, and “bottom-up” precipitation methods that are more commonly applied to inorganic materials. Wet milling and high pressure homogenization technologies are widely used for nanocrystal preparation. Wet milling (a top-down process) is a relatively effective milling technique for nanocrystal preparation. The process is done in media milling, and it treats a dispersion of concentrated drug in an aqueous or non-aqueous liquid medium with milling balls. Wet milling has several advantages in its economic value and ease of scaling up. With the right media milling equipment, manufacturers can cost-effectively create uniformly fine particles with limited or no contamination. However, due to the intensive mixing forces in the vessel, erosion of the milling balls is a common occurrence, and must be monitored appropriately. High pressure homogenization (also a top-down process) can also achieve suspensions with narrow particle size distribution. It is a purely mechanical process, which is evoked by forcing a fluidic product through a narrow gap (the homogenizing nozzle) at high pressure (150-200 MPa, or 350-400 MPa for ultra-high pressure homogenization, UHPH).6 The liquid product is subjected to very high shear stress causing the formation of very fine particles. High pressure homogenization can effectively process large volumes of liquid suspension sample thoroughly and reproducibly. Because it doesn’t use milling balls, contamination of the final product is much less; however, the high pressures applied cause a temperature increase (due to the heat of compression), and this needs to be controlled, especially for a thermally labile drug substance. Alternatively, a combination of bottom-up and top-down processes can be employed, eg, solvent dissolution of API, crystallization via a nonsolvent, and then homogenization of freshly formed particles. Antibody-drug conjugates (ADCs), a form of immuno-conjugate or bio-conjugate, are an emerging class of medicines designed for high-specificity targeting and destruction of cancer cells. The mechanism of action is targeted delivery of a cytotoxic agent to the cancer cell via monoclonal antibody targeting of a specific cell surface marker. Upon binding, a biochemical reaction activates internalization of the ADC into the cell cytoplasm, where the drug becomes active, killing the cancer cell.7 The ultimate advance with ADC therapeutics is that targeting and release of the drug specifically within the cancer cell means that healthy cells are not adversely affected, and cancer cells can be more effectively destroyed. Success in ADC therapeutics stems from a deep understanding around each of the trilogy “Antibody-Linker-Payload (drug)” technologies, with having a complementary optimization of all three to generate an effective and potent ADC. With non-cleavable ADCs, the linker unit remains attached to the drug, which mitigates externalization and the resulting side effect of the drug entering healthy neighboring cells.8 With cleavable ADCs, the drug is completely cleaved from the linker unit upon internalization, the antibody is degraded to its amino acid form, and the entire complex becomes active drug. Innovation in linking technology aspires to improve the coupling of payloads as well as to improve cleavage reactions, allowing improvements in payload delivery. The majority of ADC payloads are small molecules, which act via disruption of microtubules or inducing DNA damage. To date, there are only four ADCs that have received market approval. However, after a request from the US Food and Drug Administration (FDA), Pfizer/Wyeth, the developer and marketer of the first ADC to receive marketing approval – in 2001 for the treatment of patients with acute myelogenous leukemia (Gemtuzumab ozogamicin, trade name: Mylotarg®), withdrew the drug from the market in June 2010 (although it is still marketed in Japan). It was re-introduced into the US market in 2017. The second and third marketed ADCs are Brentuximab vedotin (trade name: Adcetris®, marketed by Seattle Genetics and Millennium/Takeda) and Trastuzumab emtansine (trade name: Kadcyla®, marketed by Genentech and Roche). They were approved by the FDA in 2011 and 2013, respectively. The newest ADC, Inotuzumab ozogamicin, was approved by the European Commission as monotherapy for the treatment of adults with relapsed or refractory CD22-positive-B-cell precursor acute lymphoblastic leukemia on June 30, 2017 under the trade name Besponse® (Pfize/Wyeth) and approved for the treatment of adults with relapsed or refractory B-cell precursor acute lymphoblastic leukemia by the FDA on August 17, 2017. The biggest technical challenge associated with any drug manufacturing process is to provide consistently efficacious drug product, which is of the required purity and is safe from environmental and process-related contamination. This challenge must be accomplished in a manner that protects employees, operators, and the general environment from the harmful substances inherent in the process, and at a cost that makes the final drug marketable. The starting point for ADC manufacturing is the parent monoclonal antibody (mAb). Often, the supply of mAbs of suitable quality for therapeutic purposes is taken for granted due to the successful developments in purification templates and platform processes in previous years. The revolutionary development of nanoscience and nanotechnology in pharmaceutical research and development opens new horizons for the creation of novel drug products, which will utilize the unique characteristics of nanosized long-acting injectable formulations. The application of engineered nanomaterials to medicine will produce nanomedicines with unprecedented benefits for the clinical outcome in many therapeutic indications. Weissig V, Pettinger TK, Murdock N. Nanopharmaceuticals: products on the market. Int J Nanomed. 2014;9:4357-4373. Bulbake U, Doppalapudi S, Kommineni N, Khan W. Liposomal formulations in clinical use: an updated review. Pharmaceutics. 2017;9:12. Paranjpe M, Müller-Goymann CC. 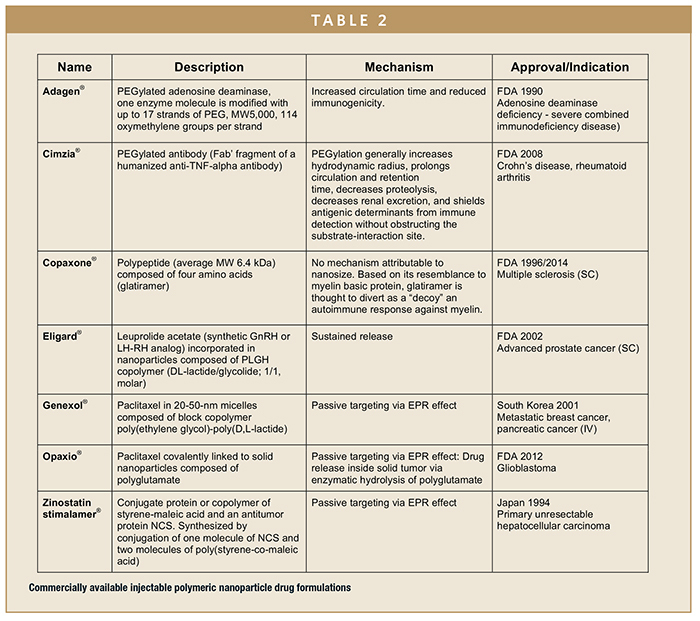 Nanoparticle-mediated pulmonary drug delivery: a review. Int J Mol Sci. 2014;15(4):5852-5873. Chaudhuri RG, Paria S. Core/shell nanoparticles: classes, properties, synthesis mechanisms, characterization, and applications. Chem Rev. 2012;112(4):2373-2433. 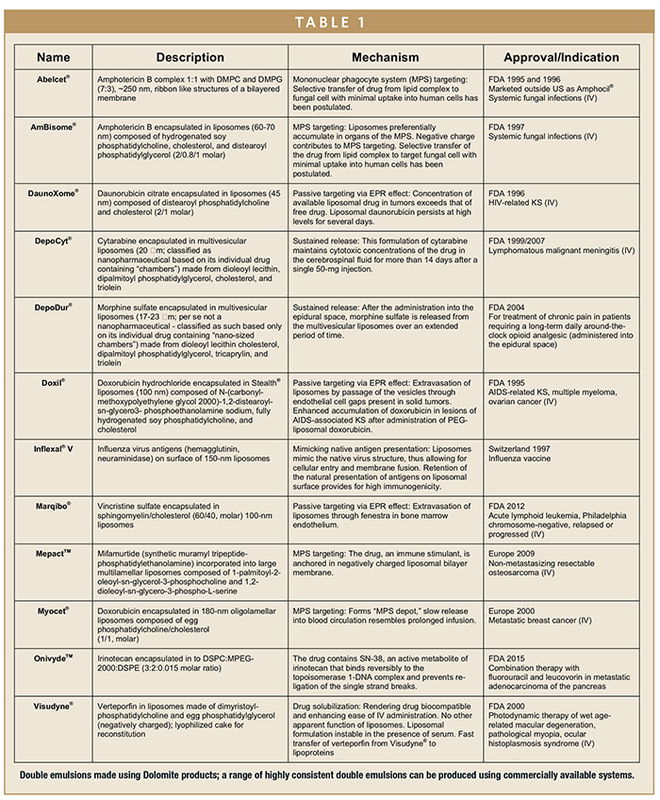 Bobo D, Robinson KJ, Islam J, Thurecht KJ, Corrie SR. Nanoparticle-based medicines: a review of FDA-approved materials and clinical trials to date. Pharmaceut Res. 2016;33(10):2373-2387. Dumay E, Chevalier-Lucia D, Picart-Palmade L, Benzaria A, Gràcia-Julià A, Blayo C. Technological aspects and potential applications of (ultra) high pressure homogenisation. Trends in Food Sci & Technol. 2013;31(1):1326. Deonarain MP, Yahioglu G, Stamati I, Marklew J. Emerging formats for next-generation antibody drug. Expert Opin Drug Discov. 2015;10(5):463-481.
de Goeij BE, Lambert JM. New developments for antibody drug conjugate-based therapeutic approaches. Current Op Immunol. 2016;40:14-23. 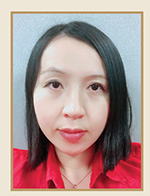 Dr. Dongwei Guo earned her PhD in Pharmaceutical Sciences from the University of Nebraska Medical Center, and joined AscendiaPharmaceuticals in 2016 following graduation as a Senior FormulationScientist. Dr. Guo has expertise in long-acting drug delivery systems, and she has extensive experience on different types of formulations, including micelles, liposomes, dendrimers, polymeric nanoparticles, nano- and micro-suspensions, and emulsions. She has also been a reviewer for the Journal of Pharmaceutical Sciences, Journal of Pharmacy and Pharmaceutical Sciences, Journal of Chinese Pharmaceutical Sciences, International Journal of Pharmaceutical Sciences and Drug Research, and International Journal of Pharmaceutical Compounding.